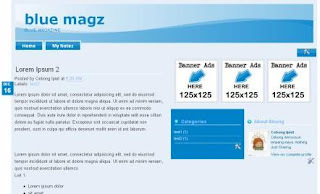 This is my another free blogger template. Blue, Three column. It's so simple so make your blog loading faster. See that unique calendar icon. You can replace ads banner. At the comment body, have a different color, owner and visitor comment. href='mailto:cebong.ipit@gmail.com' replace with your own link. I don't want to use de "readmore" option, but the "readmore>>" link appears at the end of every post. Is there a way to delete that link? i delete it by mistake the linkbar, how i get it back ?